Planting a Gardena Vertical Planter, an update on seedlings growing at home, and planting the sweet peas in the allotment garden. This piece is in partnership with Gardena, Europe’s leading brand of high quality gardening tools. They sent me their NatureUp! vertical planter to try out and I’m ridiculously excited about having it just outside my kitchen door. April is the engine of summer just starting to rev up. Within weeks (if not days!) the race of plants upwards will begin in earnest. There’s plenty that I need to do now to prepare both myself and the garden for summer. The blanket of mulch to be laid, seeds to be sown, and growing spaces to plan and plant. 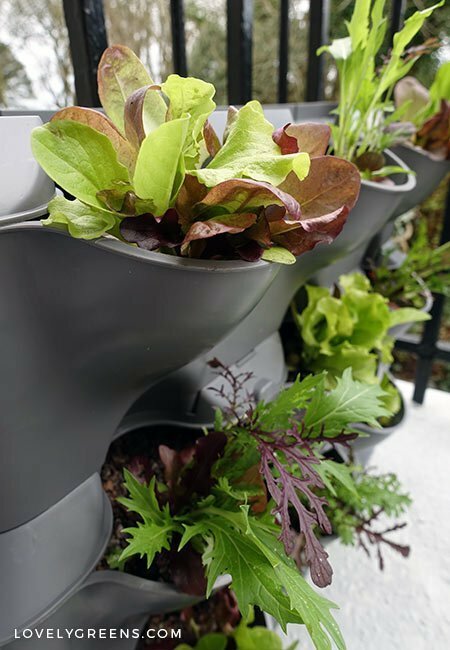 There’s no time to waste and every space is a potential place to grow food. There’s one space at home that I’ve had trouble in making productive — the space just outside my kitchen door. I’ve had plenty of planters there in the past but all low-lying and usually filled with flowers. That’s why I was very excited to be given a NatureUp! Basic Set Vertical. 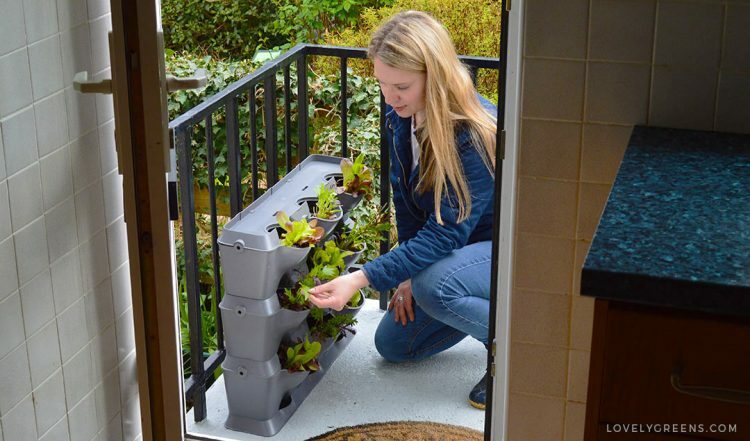 It’s Gardena’s vertical planter that can be planted with edibles, flowers, herbs, and whatever else you wish. What it’s going to do is transform some dead space into an area where I can grow fresh greens. That’s the idea with a living wall planter — it makes an unproductive vertical space into a wall of lush, living things. I’m absolutely delighted with the planter! Every time I walk past I have to admire its design and the lush greens spilling from its pockets. 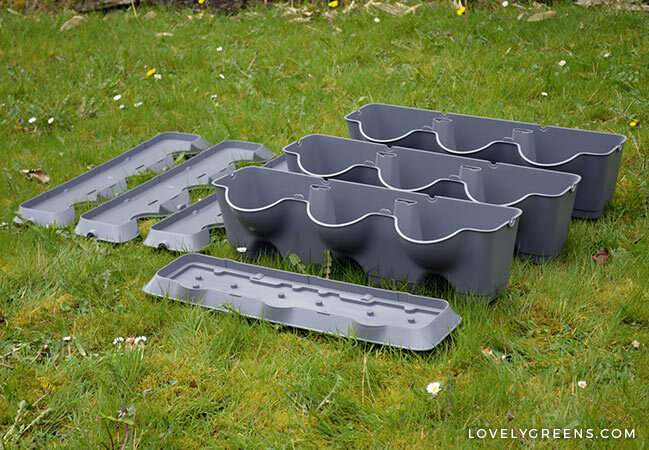 The planter arrives in seven heavy duty plastic pieces that easily click together. No tools are necessary in building it, unless you want to mount it on a wall. Fittings for this purpose are included, as are little connectors that create stability between the individual containers. I filled each container with composted farmyard manure and planted salad greens in each pocket. A mulch of horticultural grit and they were ready to be stacked. One really neat thing about the planter is that water trickles down from the top container down past the bottom and into the base unit. That way the vertical planter is very free draining — you can even hear the trickle when you water it. 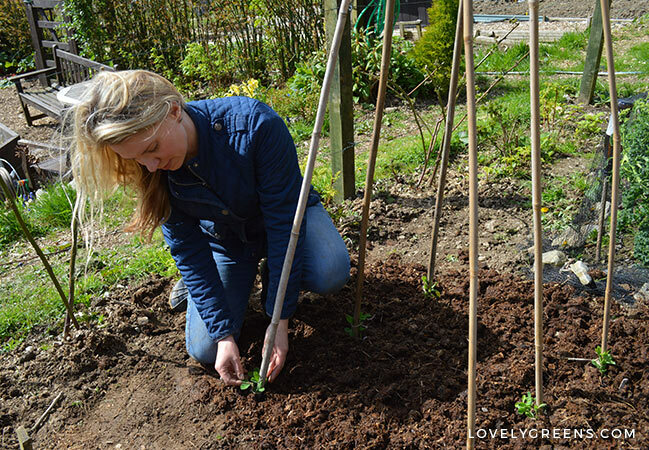 There are two main reasons that I start many of my edible plants at home first. The first is weather — it can be cold and windy in my allotment garden in April. 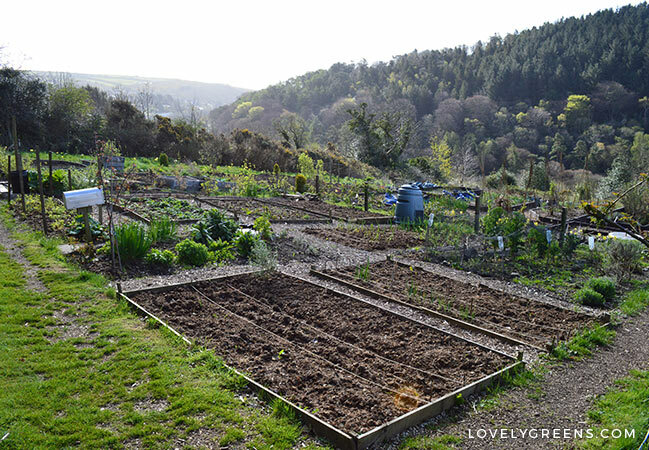 Some veg is hardy enough to be planted and sown direct and I already have planted my early potatoes and have sown seeds for radishes, beets, turnips, onions, and calendula. Though these plants are hardy, what they’ll also have to contend with is slugs. Beer bait traps work well at capturing them but our wet and mild climate just keeps bringing them on. It’s slugmageddon every year but that doesn’t stop me. They say that to be a gardener you have to be optimistic soul. You never know what challenges the year will bring but no matter what, your love of gardening sees you though! 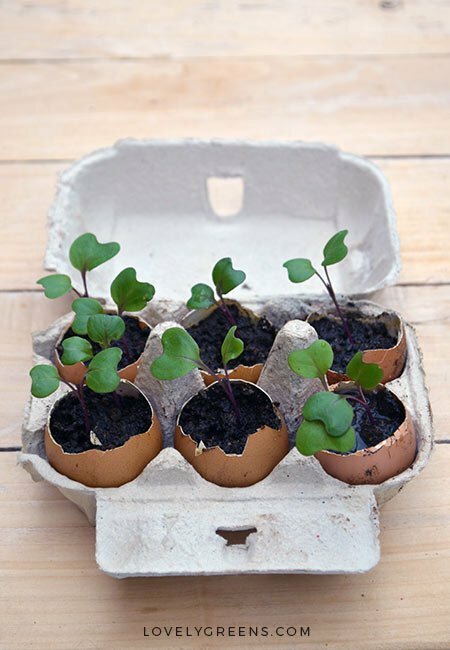 One thing I’m trying out this year that’s a little different is growing seedlings in eggshells. This is my first year trying it and I currently have baby kohlrabis happily growing in a half-dozen. When they’re ready to go out to the garden I’ll crack the eggshells a bit and then plant direct. The roots and plant will push the shell aside and perhaps draw needed minerals from it over time. I use a lot of natural, reusable, and eco-friendly plant pots and am excited to see how they’ll do. I have quite a few cabbages, broccoli, spinach, and other seedlings growing in traditional modules at home. Having them growing on in the conservatory or greenhouse means that I can check on them every morning while I have my cup of coffee. If they need watering, thinning out, or any other help then it’s easy to know what they need. Seedlings at the allotment garden need to fend for themselves a lot more. I put out precautions against slugs but we also have pheasants to contend with — and they love pecking at anything. Especially brassicas. I’m about to plant my tomatoes into the long trough planter inside my greenhouse. They’re from cuttings grown on from last year’s plants and will definitely produce fruit way earlier than usual. 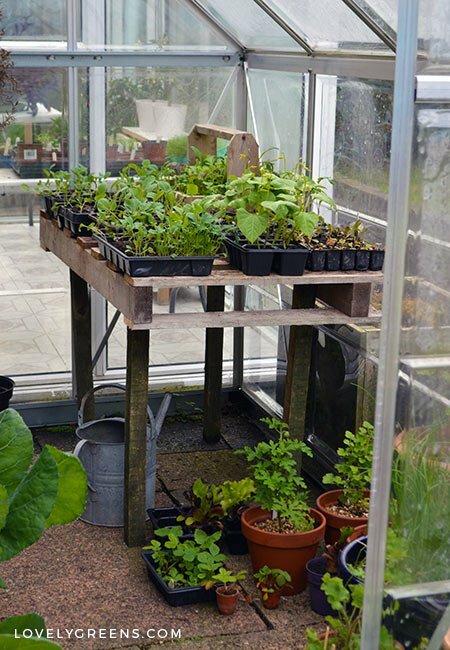 In the meantime, the potting bench is a crowd of kale, beans, strawberries, salad greens, and purple sprouting broccoli. Most of them are almost ready to be planted outdoors fortunately. I’m running out of room and need space for more plants. 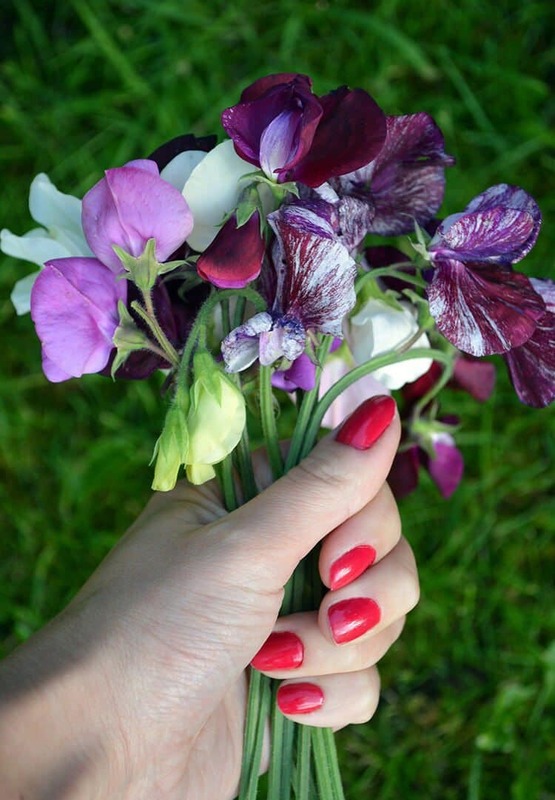 The scented flower I love to grow most of all is the humble sweet pea. I started my plants off in the winter and now finally I’ve been able to plant them outside. Three plants at the base of a bamboo cane is more than enough and before long they’ll be twining their way skywards. After planting my sweet peas I also top dressed the soil with a mulch of composted manure. 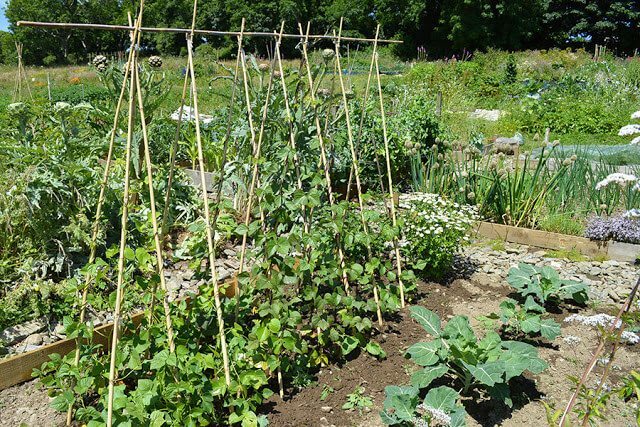 This helps keep the soil underneath moist, stops weeds from sprouting, and feeds the sweet peas. I use manure as mulch throughout my allotment garden and if it’s composted properly, it doesn’t smell. I’m growing five different types of sweet peas this year. Lady Salisbury, a Spencer mix, Heirloom sweet peas, and a couple others from the seed swap. I’m curious to know what they’ll all look like but irregardless, they will smell divine. Sweet peas make good cut flowers too. When they’re in bloom I like to set a little bouquet on my bedside table. There’s no better way to start of the day than with the fragrance of homegrown flowers — but especially sweet peas. I have quite the list of gardening tasks for the next few weeks. Not only will I be keeping a close eye on my new living wall planter but I’ll be keeping all of my other planters watered daily. If they have good drainage, the compost in containers can dry out fairly quickly. The list of crops that I’m succession sowing, so sowing every few weeks or so, is quite long: beets, turnips, lettuce, radishes, and spinach to name a few. 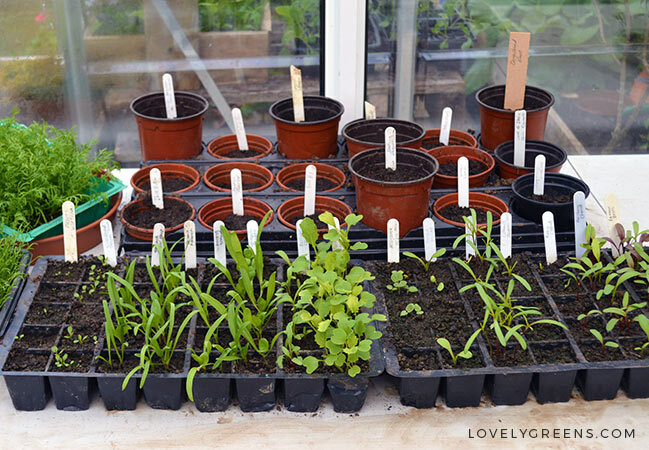 Most of these I’ve started off at home but as the summer progresses I’ll be direct sowing more. Pumpkins and squash will probably take over my garden this year. At least, that’s what it looks like from the number of seeds I’ve sown! Everything from Blue Banana to Uchiki Kuri and a few types of courgettes in between. I only got one pumpkin from my garden last year so this season I plan to have a lot more. While I grow a lot of my plants from seed, I did pick up a tray of climbing French Beans from the garden centre. I didn’t have any seeds this year and for the same cost of a packet of seeds I have a dozen healthy plants. I’d say that’s a pretty good deal. I’ll plant them outside soon, along with the peas if they ever decide to grow. Lovely Greens is a gem. I learn so many practical ways to grow my own foods and create natural beauty and home products which I can use for my family and friends. 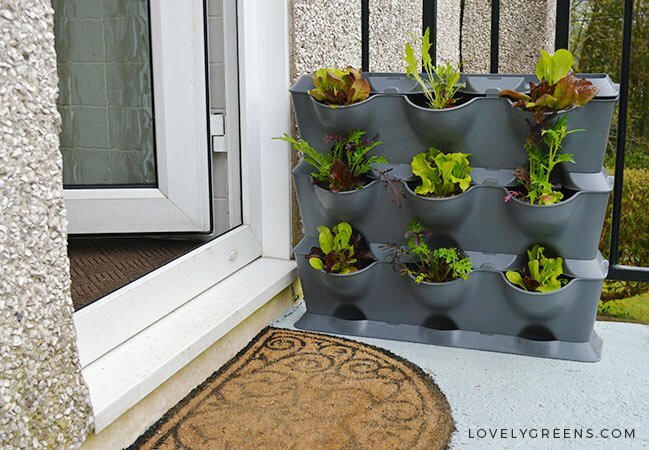 Just wondering if the vertical planter is made from recycled plastics? This is very nice! I love it! Summer is coming!